Ohio State earned the upset in 4 sets over 4th-ranked Penn State, while 8th-ranked Illinois fended off a feisty Indiana volleyball program in 5 sets to remain undefeated on the season. 5th-ranked Nebraska and 19th-ranked Michigan downed Michigan State and Iowa, 3-1, respectively to round out Big Ten opening week. Indiana gave 8th-ranked Illinois all it could handle, but fell short of the upset victory, 3-2, in Bloomington, Ind., on Sunday. The Fighting Illini came all the way back after falling behind, 2-0, winning the final three sets to stay undefeated on the season, 13-0, and in the Big Ten, 2-0. Exhale, #Illini fans. Your @IlliniVBall team is still undefeated. 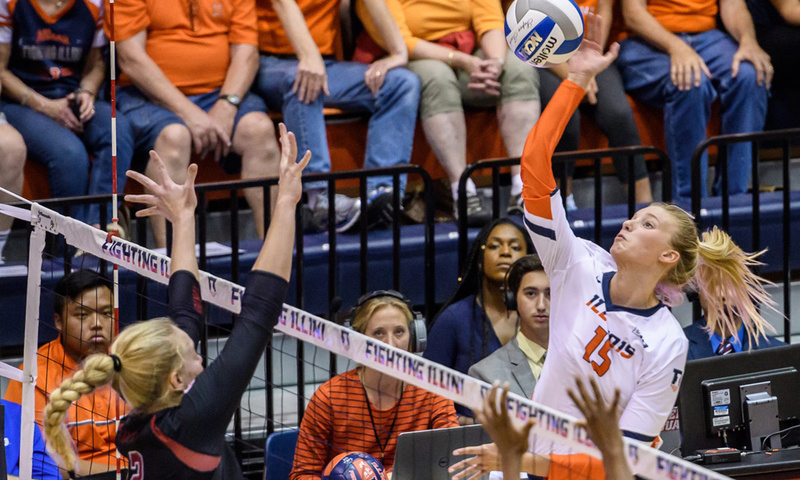 It is the 14th consecutive win for Illinois over Indiana, dating back to the 2011 season. Ohio State shocked 4th-ranked Penn State in 4 sets in Columbus, Ohio, to earn its first Big Ten win of the season Sunday afternoon. It is just the 2nd time the Buckeyes have defeated the Nittany Lions in the last 22 meetings. Penn State is 0-2 in the Big Ten for the first time since 2000 following the loss. 5th-ranked Nebraska moved to 2-0 in the Big Ten with a 3-1 victory over Michigan State inside the Devaney Center on Sunday. The Huskers have won 9-straight matchups with the Spartans and are 10-0 in the series all-time in Lincoln, Neb. 19th-ranked Michigan took down RV Iowa on the road, 3-1, to earn its first Big Ten victory of the 2018 season on Sunday afternoon. The Wolverines, who fell to 3rd-ranked Nebraska earlier in the weekend, hit .222 and served up 6 aces to earn the win over the Hawkeyes.